Tags: Aria High Roller, Justin Bonomo. Posted on Friday, June 08, 2018 by "T". 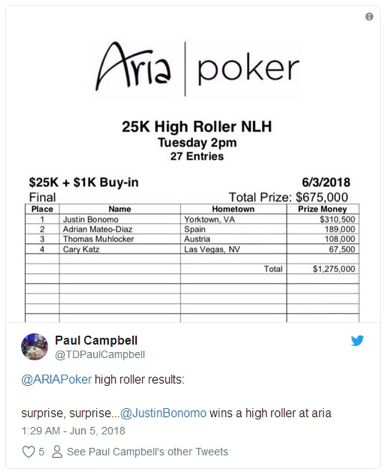 A mere few days has passed after Justin Bonomo shelled out five $25K buy-ins to win $350,000 in the Aria High Roller on May 31st, he shelled out yet again two more expensive buy-ins in the same edition on June 3rd, earning a sweet $310,500 in the end! On May 30, Justin Bonomo had won the 2018 Super High Roller Bowl for $5,000,000. In this year alone, he has already cashed for over $14 million. That $14 million earned was comprised of 18 cashes, 15 of which were final tables, and 8 of which were championships. It looks like Fedor Holz's record run in 2016 wherein he cashed for over $16 million will be shattered pretty soon. The WSOP has just started, and we know Justin Bonomo has all the time (and chances) he needs to break Fedor Holz's 2016 $16 million record win. 19 comments for "Justin Bonomo wins $310K and Second $25K Aria High Roller in 4 Days"
This Justin Bonomo is in an enviable form. He deserves all the respect of all players. We did not even reach the middle of the year and he won some impressive money in tournaments. Even after tax he has an account few million dollars. Is a very good player and his abilities are strong. right now bonomo reached final round in 10k HU WSOP... he is beast!!! yup... justin bonomo just won 10k$ HU WSOP event for 186k$... he is so sick!!! Somehow reading this article makes you wonder. He has been doing great. No doubt about that. Wonder how much more he can win till the end of the year. This Justin Bonomo wants to overcome records. 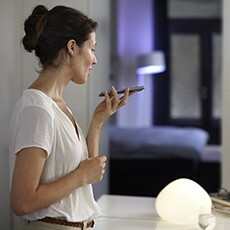 He is in an excellent form and it is normal to take advantage of this. If he can break down records why not? On this occasion he will become a well-known name in this industry and in history of these poker games. Very nice for this player. ok actually I find this hard to comprehend how on earth a poker pro can have such a significantly different year in terms of income and tourneys won, not saying cashed, but won. if you are good then you more or less should have a few ins one year, a few another and so on... and not like 20 tournaments won and millions to show in one years and then 20 years empty or even in red. You can say that this is his year, playing poker. well I see that picture here on news,so I dont from what time is picture!but I am glad that you follow him and his style every month or year !but really to have this kind of hair,you must be really crazy and that show that money doesnt mean anything in life,when you do thing like this! This man is drugged with poker games. Dismantle other players who have the opportunity to play at the tables with him. Hmmm. There are no more professional players to beat him? Where are the heavy names in poker? I think it's frustrating for many gamblers but this is poker and the best players wins. Gigantic congratulations to Justin Bonomo! He is simply unstoppable. He has been running like God! He might win this year's $1 million buy-in One Drop tournament. All the best for his future endeavors. I have been in "the zone" before... Like you're unstoppable, you win every race, you just feel great playing and playing is fun and you final table every tournament you play. That's called an upswing obviously, the opposite of a downswing. Sure he plays great, but poker is atleast 30-40% luck no matter how good you are. Heads up is where true skills show, it is as they say the essence of the game, and he's obviously great at it so I guess he tries to play heads up pots in MTTs too to reduce variance and it's paying off. I would be curious to analyze his stats at the moment, see how active he is at the table. I tend to play pretty aggro when I'm on an upswing.